Visitors are often pleasantly surprised by the warm welcome that they receive when they set foot in any of the 2,000 Gawad Kalinga (GK) villages. In every village, members of the site happily greet and entertain guests as they arrive to make them feel like they belong. For those that choose to join GK Mabuhay Tours, a program that gives people the opportunity to temporarily live in and volunteer at a GK site, the experience becomes even more profound. 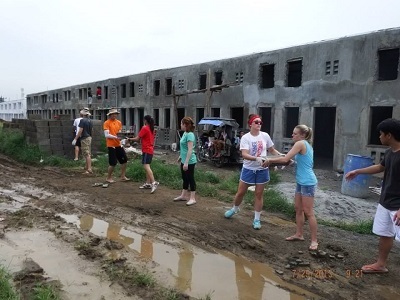 American and Malaysian volunteers of the members of the Fellowship of Catholic University Students (FOCUS) joined the fight against poverty by helping in the construction of houses. In a recent Mabuhay Tour to the GK Toyota Village in Sta. Rosa, Laguna, members of the Fellowship of Catholic University Students (FOCUS) from USA and Malaysia bore witness to the unique charm of the community and the arresting warmth of the GK residents. 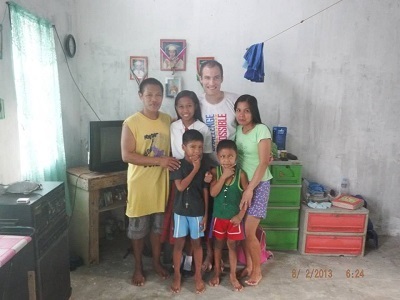 Alex, one of the volunteers, happily poses with his host family. GK residents gladly opened their homes for 12 volunteers from USA and 9 from Malaysia and each volunteer was treated as part of the family, instantly gaining parents, siblings and friends. Every day, the group heard Holy Mass at the local church before having breakfast at the GK site. They would also do chores, build homes and spend time with the GK residents, especially the children. 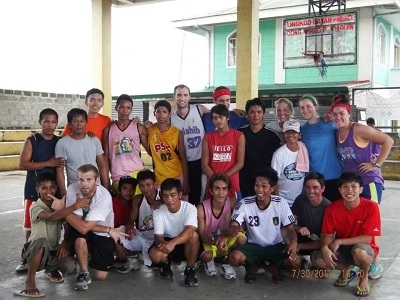 Aside from building homes, the group also played basketball games with the people of the GK community. 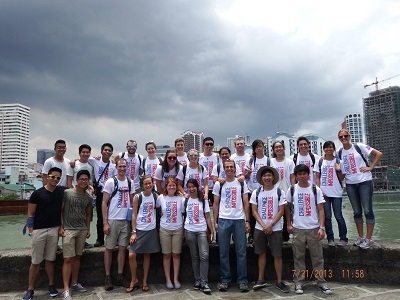 For the group to learn more about the Philippine culture and heritage, they were given the chance to visit Intramuros, the oldest district of Manila. They also went to Island Cove Resort and Leisure Park in Cavite to relax and unwind at the end of their trip. The 14-day journey marks the sixth visit of FOCUS to the Philippines to do mission work with Gawad Kalinga. Gawad Kalinga is not a charity, rather, it's an organization that aims to end poverty by building empowered and sustainable communities. GK Mabuhay is a program that allows international volunteers to embark on a journey of caring and sharing in the Philippines. They get to experience the best of Filipino culture and hospitality by immersing in a GK community, and make memories that will last a lifetime as they volunteer for various GK programs and activities. Click HERE for more information about going on a volun-tour.